Australia has ambitious goals for international enrolment growth and aims to host as many as 660,000 students by 2020 – an increase of roughly 117,000 students, or 30%, over 2012 levels. As we reported recently, things are trending in the right direction in Australia of late. For the first time since 2009, Australia recently registered an increase in international student enrolment. 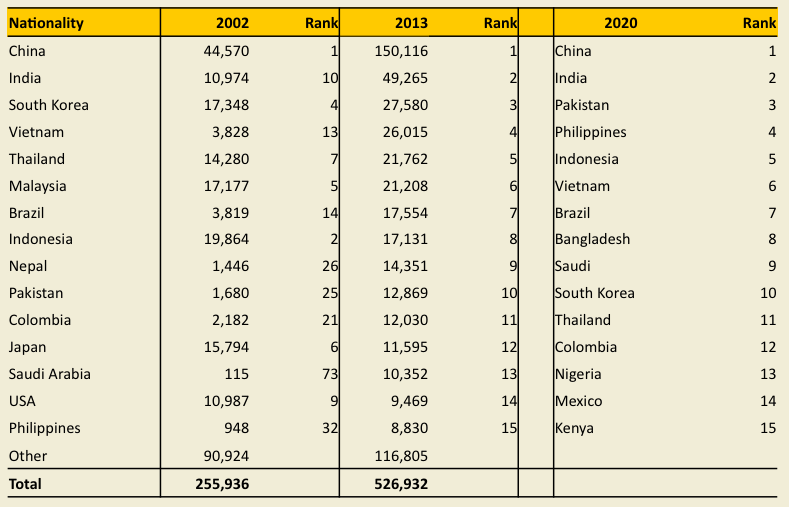 There were 526,932 international student enrolments in 2013, marking a 2.6% increase over 2012. The 2.6% growth rate compares to an average 5.9% growth rate over the past ten years – but also represents a distinct reversal of the enrolment declines recorded in 2010, 2011, and 2012. In fact, just-released statistics from Australia Education International (AEI) paint a convincing picture of continuing growth in 2014. The year-to-date (YTD) commencement numbers reveal 21% growth in new student enrolments through the end of March 2014 compared to the same period for 2013. English Australia notes as well that, while growth was variable across the system, the year-over-year results represent the best enrolment growth for Australia since the previous peak in 2009. Looking ahead, it seems clear that if Australia is to meet its longer-term targets, it will need to balance growth in established markets, such as China, with the development of key emerging markets. In his remarks at the recent ICEF Australia New Zealand Agent Workshop, Quentin Stevenson-Perks, Assistant General Manager, International Education Division at the Australian Trade Commission (Austrade) noted that one of the major priorities for his organisation is the qualification and identification of opportunities for Australian education providers, including transnational and cross-industry education opportunities and particularly those in Asia and key emerging markets. Given the importance of the rapidly expanding mining and resources sector to Mongolia’s economy, Mr Stevenson-Perks explains that the 2013 exhibition placed a strong emphasis on vocational education and training opportunities, and reports that, following the establishment of the Mongolian post, international enrolments from Mongolia increased from 400 in 2011 to 650 in 2013. The key emerging markets identified by Austrade are characterised by growing populations of young people and their potential for sustained high economic growth. However, Mr Stevenson-Perks notes as well that each also has important constraints on the domestic supply of quality education along with emerging skills gaps due to their expanding economies. GDP is forecast to increase by more than 7% per annum over the coming years. Mr Stevenson-Perks concludes that the main message for Australian education providers is that they need to stay agile and adaptable to changing market conditions. Mr Vetrak also notes that the strongest sending countries are poised for further growth, and while Australia does not capture the market share to the fullest, these countries are far from its previously reached historic maximum. In addition, some source markets have been invigorated recently through additional incentives to study abroad (such as the Ciências sem Fronteiras scholarship programme in Brazil). This entry was posted in Australia, Australia/Oceania, Higher Education, K-12, Language Learning, Most Popular, Regions, Vocational and tagged vocational education, education abroad, colleges with international students, international students, prep schools with international students.